While a trade show booth can do a lot for your business,‭ ‬it can also end up costing a lot without providing any return.‭ ‬Find out how to ensure the former‭! According to‭ ‬Business Week,‭ ‬an average small business should expect to spend‭ ‬$10,000‭ ‬or more on a trade show booth.‭ ‬If that seems high,‭ ‬it’s important to remember that the booth itself isn’t the only cost that comes into play.‭ ‬There are also things like paying for services related to the show and getting there in the first place.‭ ‬While those individual expenses may not be that much,‭ ‬it doesn’t take long for them to start adding up. Because this is a significant cost for most small businesses,‭ ‬you’re going to want to get the best return possible on the money you invest.‭ ‬Unfortunately,‭ ‬many businesses don’t achieve‭ ‬that goal.‭ ‬There are plenty of‭ ‬examples of businesses that give up on trade shows because they can’t justify their expense.‭ ‬Whether your business has already experienced a trade show disappointment or you’re extremely worried that’s what’s going to happen,‭ ‬the good news is there are plenty of steps you can take to maximize your chances of making this investment a success. The first thing you need to do is define your specific goal.‭ ‬Although this may seem obvious,‭ ‬too many businesses overlook it.‭ ‬Instead of really drilling down to identify what they want to accomplish,‭ ‬they simply settle for a broad definition like marketing.‭ ‬But in order to define whether or not your booth is a success,‭ ‬you need to know exactly how you’re trying to utilize it.‭ ‬Obtaining leads,‭ ‬strengthening relationships with customers,‭ ‬branding,‭ ‬recruiting or attracting investors are all examples of more specific goals for a booth. Once you know exactly what you’re trying to accomplish,‭ ‬you’ll be able to evaluate whether or not a specific event is the right fit for achieving that goal.‭ ‬Keep in mind that just because an event is popular doesn’t automatically mean it’s the right fit for your business.‭ ‬If you can’t nail down exactly how that specific event is going to make your goal a success,‭ ‬it’s almost guaranteed that it’s not the right fit. The next tip to make your investment a success is to actually have a budget for it.‭ ‬Due to the nature of trade shows,‭ ‬it’s fairly easy to end up spending significantly more than you expected.‭ ‬Because keeping your costs low will make it easier to get a positive return,‭ ‬you really need to know your numbers.‭ ‬That being said,‭ ‬don’t feel the need to go so cheap that it lessens the effectiveness of your booth.‭ ‬Instead,‭ ‬simply being very aware of what you’re going to spend will make it much easier to avoid overspending. The fourth tip is to find the right members of your team to work your booth.‭ ‬If your business only has a couple of people,‭ ‬chances are you will all work it.‭ ‬But if you’re a larger organization,‭ ‬you need to find the right match.‭ ‬Once again,‭ ‬this goes back to pairing with the goal you identified.‭ ‬It makes sense to have different members of your staff work the booth if your goal is recruiting than you would if collecting leads is what you want to accomplish. The fifth way to make your trade show booth a success is to stand out.‭ ‬Regardless of the size of the event,‭ ‬you’re not going to be the only business that has an exhibit there.‭ ‬If you’re wondering how to make sure the audience you’re trying to reach both notices and remembers you,‭ ‬using‭ ‬unique promotional products is a tactic that works very well.‭ ‬Whether you opt for koozies,‭ ‬backpacks or another customized item,‭ ‬there are two big reasons this approach is so effective. If you’re in the process of planning for your first trade show booth,‭ ‬you’re probably going to run into at least a few minor challenges you didn’t expect.‭ ‬But as long as you take the time to follow everything we discussed above,‭ ‬you should be able to avoid major problems and put your business in the best possible position for having a successful trade show. Thanks for sharing about trade show tips. .I think trade shows only for meet, greet and sell-your-stuff of the business in the global world market. Trade Shows is the major source through which one can get great opportunities for growth of his business. . . and if h’she don’t want then it is just the normal show. You make great points with regard to getting the most out of your costs and leaving a unique impression with your promotional product use. Having the right “swag” in place can impress attendees and ensure they remember your company, just as you’ve shared. Great article. Defining your goals is very important. Far too often are business marketing strategies focused on brand awareness alone. Trade shows are great for getting your name out there. But, if you expect more than brand awareness, be sure to give the customer something actionable and be quick to do some follow up. Great article! I couldn’t agree. I feel like a good trade show can be a huge break for any business. Not going cheap on things such as banners can be a big investment for your business! All very important tips to remember. Giving out free stuff is definitely a plus! I guarantee you it will be worth the money. However, while I do believe you need the right person to work at the booth, I think you need more than one. If you only have one worker, you are only able to talk to a few people at a time. If there are more workers, more people can get the attention they want, and people will be attracted to your booth when they see its high activity. I think trade shows are great if you have a business or product that is unique. It is also a great way to network. But the costs to prove to be too high for my liking for very little ROI. Thank You For Sharing information and the best aim is to create the information and the best aim is to create the differences in the site. I think trade shows only for meet, greet and sell-your-stuff of the business in the global world market. It is very important to connect with your peers on trade show. Building a relationship is very important in business growth. Gail, this is a really useful post! Honestly, I have yet to work a trade show into my marketing mix, but I know that relationships are the hallmark to building a business, so connecting with your peers at trade shows is a “must” in a lot of ways – especially if you want to be seen as an authority. 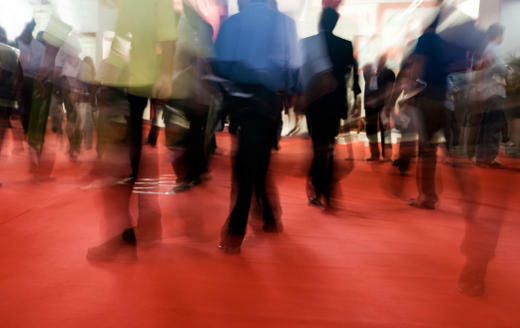 Trade shows can be a great place to connect with a lot of people all at once. Many of the better events include trade shows to make it easier to connect. Seeing you speak is one thing, but being able to look you up, come by your booth, and pick up additional information and a useful promotional item can really make an impression. Be sure to give away something practical someone will keep close by (or so crazy that they will keep it on their desk!) that has your URL, name, and phone number on it. I used to keep a jar full of pens I collected so when I wanted to recommend someone I would just pull the pen out. High quality distinctive pens are one of my favorites. So are keyboard and mouse wrist rests.